Nowhere, perhaps, in all the four Gospels, do we find this part of our Lord’s character so beautifully illustrated as in the story before our eyes. It is hard to imagine anything more tiresome and provoking than the conduct of Thomas, when even the testimony of ten faithful brethren had no effect on him, and he doggedly declared, “Except I see with my own eyes and touch with my own hands, I will not believe.” But it is impossible to imagine anything more patient and compassionate, than our Lord’s treatment of this weak disciple. He does not reject him, or dismiss him, or excommunicate him. He comes again at the end of a week, and apparently for the special benefit of Thomas. He deals with him according to his weakness, like a gentle nurse dealing with a froward child–“Reach here your finger, and behold my hands; reach here your hand, and thrust it into my side.” If nothing but the grossest, coarsest, most material evidence could satisfy him, even that evidence was supplied. Surely this was a love that passes knowledge, and a patience that passes understanding. A passage of Scripture like this, we need not doubt, was written for the special comfort of all true believers. The Holy Spirit knew well that the dull, and the slow, and the stupid, and the doubting, are by far the commonest type of disciples in this evil world. The Holy Spirit has taken care to supply abundant evidence that Jesus is rich in patience as well as compassion, and that He bears with the infirmities of all His people. Let us take care that we drink into our Lord’s spirit, and copy His example. Let us never set down men in a low place, as gracious and godless, because their faith is feeble and their love is cold. 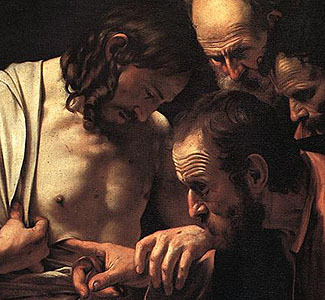 Let us remember the case of Thomas, and be very compassionate and of tender mercy. Our Lord has many weak children in His family, many dull pupils in His school, many raw soldiers in His army, many lame sheep in His flock. Yet He bears with them all, and casts none away. I want this on my email.